A garage door is an expensive investment, and its proper functionality highly depends on every one of its components being properly installed. One of the most crucial parts of the system are the springs. Incorrectly installed units can cause irreparable damage to your door and can also result in critical injuries. Not only is that, but the very act of fitting and replacing them is an incredibly dangerous and complex task. While most DIY handymen can tackle almost anything that needs fixing around the home, replacing garage door springs is one of those jobs best left to the experts. The main purpose of the springs is to help your door up and down by supporting its weight and providing it with tension based force. While these components are readily available to purchase they must be wound incredibly tight during the installation process and can literally snap without warning. Such scenario can cause serious injuries, which is why professional assistance is advised. 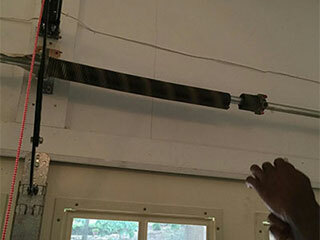 Even if you are on a budget, trying to replace a garage door spring by yourself isn't worth the risks. Without the right equipment and training, not to mention skills and experience, the door can literally come crashing down on you. When the spring itself breaks, it could whip around and cause severe lacerations to anyone standing nearby. You may think that you're saving some money by performing this task by yourself, but if anything goes wrong, you'll be paying a lot more. Not only could you get hurt, but other parts of your garage door system could get damaged in the process, which will result in more expensive repairs. Regardless of whether your garage door is equipped with extension or torsion springs, replacing them is still very intricate, difficult and dangerous task. Although torsion units are considered safer, due to their lower likelihood of whipping around when they break. Even spring adjustment requires a professional technician's assistance. Although not as complex as replacement, you are still dealing with a lot of tension, and the same dangers exist. When performing some maintenance on your door, you should spend a little time examining your springs and making sure that their condition isn't deteriorating. The best way to prevent an accident is to have them replaced before they end up breaking. You should also try to see if you can hear any abnormal squeaking while your door is in motion. This could suggest that your springs need to be lubricated, which will help them work more efficiently, and reduce their wear and tear damage. When the situation calls for professional help, contact our team at Garage Door Repair Puyallup right away and our technicians will take care of the problem without jeopardizing anyone's safety. Many local homeowners have come to rely on our professional technicians for help with their garage door system. Our dedication to excellence and commitment to customer satisfaction keeps us at the top of our game. You can use our online system to easily schedule an appointment. Thank you for choosing our company! Feel free to browse our website for more information in the meantime. Our team at Garage Door Repair Puyallup is at your service any time!